Over 20 new boat brands are available to view including Fairline, Bayliner, Beneteau, Sessa and more. With such an exciting variety on display we’re sure there will be something of interest to everyone. A large range of marine merchandise and services including chandlery, servicing and engineering, clothing, insurance, financing and the RNLI will be available for advice, guidance and some retail therapy. 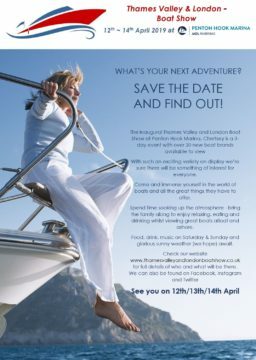 Come and immerse yourself in the world of boats and all the great things they have to offer. Food, drink, live music on Saturday and glorious sunny weather (we hope) await. See you then! To view more new and used models, our Chertsey head office is only 3.2 miles away! !